Traditional foods are the ones that satisfy us at the deepest level of our being because they connect us back to family history, Mother Earth, and the building blocks that fuel our physical bodies and nourish our minds. Bone broth is a simple, time-tested traditional food with major health and mood benefits. It is based on ancient wisdom, but it is also the latest trend too. Celebrities are raving about bone broth as a better alternative to Botox and a bone-healing miracle. No wonder it’s being called the new green juice! 1. Bioavailable Collagen - This is the health and beauty star that makes bone broth a unique healing food. Collagen is the body's most abundant protein. Collagen supports, strengthens, cushions, provides structure, and holds the body together like glue. In bone broth, the collagen has been broken down into gelatin, which is easily digested and assimilated into the body. This can be very helpful for sufferers of leaky gut. And your skin, hair, teeth, nails, bones, joints, and organs will love it too! 2. Bioavailable Nutrients - Bone broth contains easily digested amino acids, vitamins, minerals, and essential fatty acids. Consuming the broth is a gentle way to get important nutrients into your body. 3. 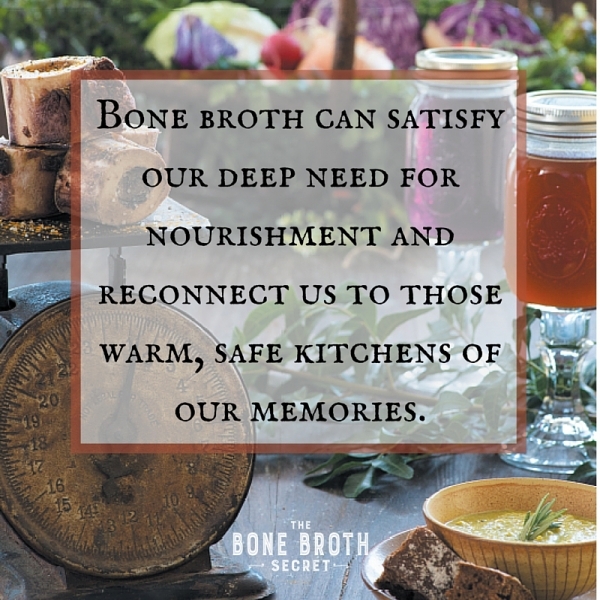 Less Waste – Better for Your Wallet and the Planet – Bones, vegetable scraps and water can make a delicious bone broth. In this way, you turn what was destined for the trash into a tasty, nutrient-dense food source. 4. Healing Flavor Enhancer - Bone broth has been used for hundreds of years as a gourmet flavor enhancer. Chefs call it liquid gold because it adds rich flavor to many foods. It’s delicious on its own or can be used as a flavor base for soups, sauces, stews, breads and grains! It is a beautiful and versatile way to let food be your delicious medicine. • Add filtered water to cover by about an inch or two. • Add apple cider vinegar. • Strain the liquid through a fine mesh strainer into a bowl. You can then remove the meat from the oxtail bones and set it aside for pate or other recipes. • Allow the broth to cool and ladle into wide mouth Ball jars (fill only 2/3 of the jar if you plan on freezing the broth). • Refrigerate or freeze. When ready to use, remove the fat cap that has risen to the top (you can discard the fat cap or save it for cooking). The broth will last in your refrigerator for up to 6 days and in the freezer for up to 2 months. To learn more, see my book with Louise Hay, The Bone Broth Secret - A Culinary Adventure in Health, Beauty, and Longevity and call in to my HayHouseRadio.com Show - Loving Yourself To Great Health on Mondays 3-4 PM PST.